The boy did good – came home to a lasagne cooking! | Outfit details | Instagram magnets adorning our fridge | Trying out these new Dole porridge pots. Have you tried these yet? 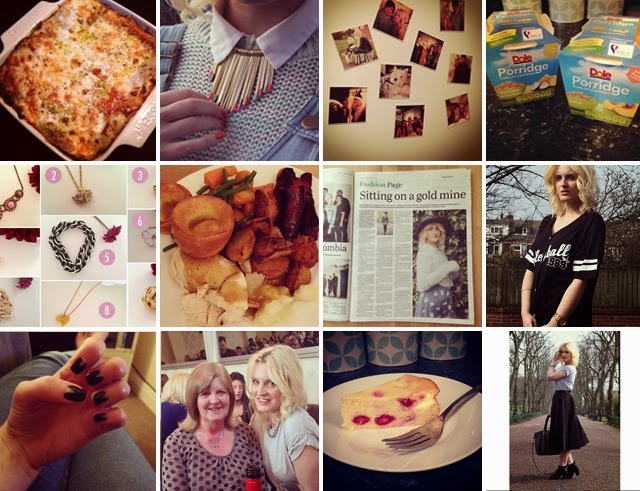 | Pearls & Pieces wish list on the blog last week | Sunday roast on a Saturday. Living life on the edge! | My little blog made the papers! Full page spread in the Lancashire Evening Post! | Loving my Primark volley ball tee | Chevron nails | Mother’s Day with my beautiful mamma! | Homemade New York style baked cheesecake | Outfit pictures in the local park.